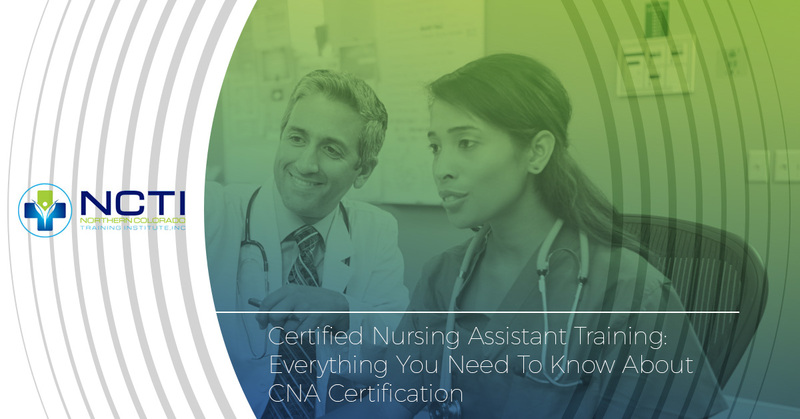 Certified Nursing Assistant Training: Is CNA Certification For You? Are you interested in becoming a CNA? You’re not alone. Many people come to us by searching “CNA classes near me” or “CNA programs near me,” because it’s a growing field with a lot of opportunities. What does it take to become a CNA? First of all, you need to be a team player who doesn’t mind having tasks delegated to them. Someone who wants to be a CNA will be working with the basic day-to-day care needs of patients on a very close basis, so having a big heart and being a people person is a must! On the technical side, you’ll need to take a CNA program like the one we offer at our Fort Collins training facility. 66 hours of theory and skills in a classroom are required, as well as 16 hours of clinical experience. After that, you’ll be eligible to take the exam to be a CNA in Colorado. You’ll find CNAs working just about anywhere you’ll find a nurse. This includes private hospitals as well as state and local hospitals. But the most common place you’ll find CNA is in nursing homes and other types of long-term care facilities. CNAs often work with the elderly, taking care of their basic needs and offering emotional support. No matter where a CNA ends up, they will be taking care of the everyday needs of patients or those who live in nursing homes. Because they end up spending so much time with patients, CNAs often form a special bond with those they are caring for. In fact, in a nursing home setting, there is no one more involved with the patients’ lives than the CNA. This means that the CNA is with a patient for every aspect of their lives, the good and the not so good. But for someone with a heart for helping, it’s the perfect job! Here is a short list of the most common duties that a Certified Nursing Assistant will perform on an average day. It’s this last one that’s just as important as everything before it. You’ll spend so much time with patients that they will often become your friends. Their children might not stop by as often as they’d like, so they’ll want to talk to you about their lives (past and present). Others in the nursing home might not be as coherent as they are, so they may be desperate for someone to talk to. When you get your CNA certification and start working, you’ll realize just how important you become in the lives of so many people. What medical professionals do CNAs work with? As the name suggests, certified nursing aids are most likely to be working under the supervision of registered nurses. Nurses will be helping patients with more advanced care while CNAs will take care of patients’ day-to-day needs. CNA can also receive instructions from doctors. CNAs can work with just about any type of patient, but are more likely to be working with patients with long-term needs. This often means working in a nursing home (see above), but you’ll find CNAs just about anywhere you find nurses. Where do CNAs fit in the nursing hierarchy? CNAs are pretty much the lowest rung on the nursing ladder. But getting CNA certification is also an excellent starting point for those who want to learn even more and become a nurse. While there’s no official list of the nursing hierarchy, the following can give you a good idea of where you can advance as you move past your CNA training. Chief Nursing Officer (CNO) – At the top of the nursing ladder are the CNOs. A CNO often has a master’s degree and a huge amount of responsibility at a hospital, working with the CEOs. The CNO may not see any patients at all but is responsible for all of the actions of nurses at their particular hospital. Director of Nursing – The leader of the nursing department who directs Nurse Managers (see below). They usually have a master’s degree and work with the CNO in order to lead specific nursing departments. Nurse Manager/Nurse Supervisor – This is the level of nursing where administrative and patient care meet. Nurse Managers will often deal with scheduling and hiring within their unit, but they’re also involved in patient care. Advanced Practice Registered Nurse (APRN) – APRNs are one of the most exciting levels of nursing out there, and will play a huge part in the future of medicine. APRNs can provide various levels of direct patient care, but it varies by state. In some states, APRNs are patients’ personal care providers (PCPs), able to diagnose and treat their patients. It takes at least a master’s degree to become an APRN. Registered Nurse (RN) – Without a doubt, this is what the bulk of nurses are. RNs are providing a great deal of patient care, and most patients get to know their RNs better than any other employee in the hospital. Licensed Vocational Nurses (LVN) / Licensed Practical Nurses (LPN) – LPNs deliver basic patient care including prescription delivery, inserting catheters, taking vital signs, and changing bandages. Becoming an LVN or LPN takes about a year of training. Certified Nursing Assistant – While CNAs require training, they are not officially nurses. Technically they are unlicensed assistive personnel. As you can see, there are many places that you can go when you start your nursing career. While you can go to college full-time in order to start off as an RN, the cost associated with college is out many people’s reach. 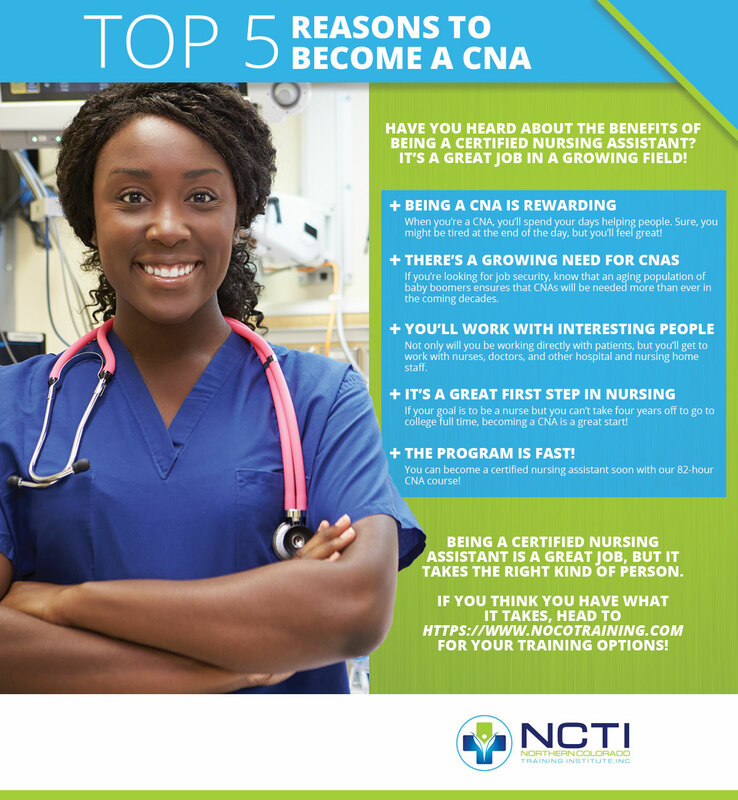 Starting with CNA programs is a great first step! Can You Simply Stay A CNA? Sure! With all this talk about climbing the ladder, there’s always the chance that you’ll be perfectly happy with where you are. There are many reasons why someone might want to stay a CNA and not seek higher certification or degrees. If they aren’t comfortable with more responsibility, staying a CNA might be an option. They might also enjoy the “in the trenches” care that a CNA delivers and like the direct, personal interaction with patients. How much are CNAs paid? Here’s the point at which we’d like to tell you that CNA training will get you a $100,000 job right out of the gate. Unfortunately, that’s just not the case. CNAs in Northern Colorado tend to earn around $30,000 a year. But there are three major reasons why the pay isn’t so bad when you think about it. Being a CNA can lead to bigger and better jobs, and it can be your great start when you want to climb the nursing ladder we talked about above. $30,000 a year comes out to about $14 an hour, which is three dollars more than the minimum wage in Colorado. It’s also almost double what the national minimum wage is. If you have the heart for it, it beats just about any other job out there! You’ll go home tired, but you’ll go home knowing that you helped someone. Being a certified nursing assistant is hard work, but it pays more and is more fulfilling for most people than working at a fast food establishment or in retail. Will there always be a need for CNAs? Prospects for CNA job growth is actually very good, growing faster than most jobs out there. In the next decades, the job market for CNAs is estimated grow by about 11-percent. What’s the reason? Two words: Baby Boomers. While people have been living longer as a whole, there’s an entire generation coming up who are just starting to need long-term medical care and will be living even longer. The oldest baby boomers are about 75 right now, and the youngest are about 53. That means another 30 years of people who will need CNAs as part of the medical care. This will be true no matter where you live in the United States, so long as you meet that state’s requirements and pass their certification exam. Ready To Start CNA Training? If becoming a CNA sounds like something you’d enjoy, we’d love to have you in our CNA classes. Click here to check out the latest schedule for upcoming classes!